Credihealth hosted a webinar for the doctors working here on “Life of patients on Chemotherapy”, hosted by Dr. Vijay Agarwal, senior consultant from Aster CMI hospital in Bangalore. 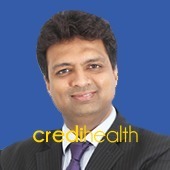 Dr. Agarwal comes with more than 16 years of experience in dealing with medical and surgical cancer patients. A fever of 100.5°F or higher, taken by mouth- no medicine for the fever to be taken. Fatty, greasy, or fried foods. Nuts, seeds, or dried fruit. Patients to be encouraged to maintain good mobility in and around the house. To do light exercises. Not to combine therapies like allopathy with Ayurveda or any other alternative form of therapy. Flush toilets twice each time they are used. If possible, patients should use a separate toilet from others in the home. Always wash hands with soap and water after using the toilet. Caregivers must wear gloves when handling the patients’ blood, urine, stool, or emesis. Dispose of the gloves after each use and wash your hands. After using any devices for bodily waste, patients should thoroughly wash their hands and the devices with soap and water. Dry the devices with paper towels, and discard the towels. Any sheets or clothes soiled with bodily fluids should be machine-washed twice in hot water with regular laundry detergent. Do not hand wash. If you cannot wash them right away, place them in a sealed plastic bag. Absorb-able undergarments should be placed in sealed plastic bags for disposal. If caregivers accidentally come in contact with bodily fluids, they should wash the area of exposure several times with soapy water and inform their doctors on their next visit. A single exposure may not do much harm, but caregivers should take extra precautions to avoid repeated exposure. Be sure that someone is with the patient, because more help may be needed at those times. Watch for any sign or symptom listed in the “When to Call Your Doctor” section on your drug sheet(s). For some people, the risk of infection is so high that their doctor will recommend avoiding travel while receiving chemotherapy. Restrictions on flying – some people with cancer may not be permitted to fly because the oxygen levels and changes in air pressure at high altitudes can be dangerous. Article contributed by: Dr. Vijay Agarwal, senior consultant from Aster CMI hospital in Bangalore.